There are many things to be done, but means are wanting in this country. We have brains, but no hands. We have the doctrine of Vedanta, but we have not the power to reduce it into practice. In this quote, Swami Vivekananda points to the great challenge of translating ideas into practice in the Indian context. 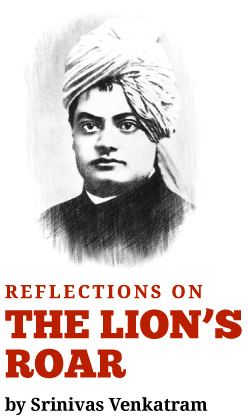 Swami Vivekananda again and again points to the fact that India has some of the noblest ideas that have been conceived by the human brain – the doctrine of Vedanta being a good example – but has failed to transform this doctrine into “lived practice” in the country. Three, ideas which need to be assimilated by communities or groups of people. The nature of these challenges is quite different. sustained willingness to overcome implementation challenges. developing the willingness to consciously improve oneself day to day, hour by hour, so that we realize the full potential of the idea in our own lives. At a collective level, assimilating an idea can mean an altogether different process. Firstly, it means collective acceptance of an idea as something meant for collective good. Second, it means collective commitment to that idea, which means that we individually and collectively come together, for a shared purpose. Third, it means collective adoption of common ways of working or at least shared norms which govern both individual and collective action. Fourth, it means viewing success in terms of collective outcomes, beyond individual outcomes. Collective acceptance of an idea means collective discovery of the value and relevance of an idea, overcoming both (a) the cacophony of individual opinions (b) the blind dogmatic acceptance of an idea just because it came from a source of authority. Collective commitment to an idea means a deep engagement with an idea by all members of the collective – irrespective of status and hierarchy. Collective adoption of an idea means being able to evolve, individually and collectively, from our current state of practice to a new way of living and working. This means being willing to improve one’s own way of working, and enabling individuals to accept and submit to shared ways of working. Collective success means being able to identify ourselves at a wider level with the collective, rather than with our “little selves” alone. This means invoking a wider identity and shared vision of success in every individual in the collective. Most important, it means a collective recognition that working in collective self-interest leads to far superior and more sustainable outcomes, for both individuals and the collective as a whole. This means moving beyond narrow self-interest to enlightened self-interest in all our actions. Let us examine the Indian context and see which of these scenarios Swami Vivekananda was referring to. Any thinking Indian with a little reflection, will point out that there are innumerable cases where we, as individuals, have learnt to practice great ideas in our individual lives; and there are many cases – though not as many as we would like – of great implementation of ideas provided a particular individual or team has driven it. Where the gap is felt most, is in the assimilation of ideas in a collective context. It is here that there is need for fresh thinking and reflection among leaders and citizens. When Swami Vivekananda says that “we have not the power to reduce it (Vedanta) into practice”, his emphasis is on the “we”. learning to see ourselves as a “collective of individuals” working towards a shared future, that includes all Indians, all communities, all geographies, all economic groups, and all age groups. It is only by assimilating ideas and reducing them into practice as a collective, that we will be able to translate, not just great ideas, but even basic ideas like Swachh Bharat, into a reality for our country.